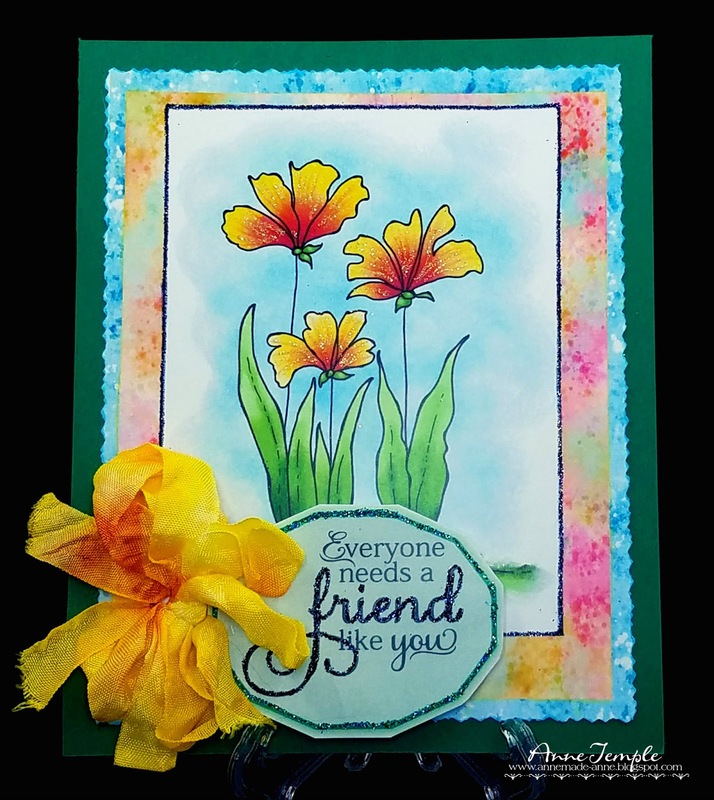 Anne here and today I have a card that showcases the Happy Flowers Digi Bundle set that was released this month. It makes me smile every time I look at it as it is so bright and cheery. I wanted to show that even if you use pre-colored images, you can make it unique. I started out by layering two of the digi papers that come with the Digi Bundle into my software. (I use Word - nothing fancy). Then I brought in one of the colored images (there are quite a few that come with this Digi Bundle) and layered it on top of the patterned papers. For the sentiment, I began by using one of the pre-programmed shapes, changed the color of it and added it to the side of my focal image. Next I uploaded the actual sentiment I wanted and resized it so that it would fit into the shape I had. Once that was done, I printed everything and then began adding my personal touches. I fussy cut out the shaped sentiment box, added glue (Sakura glue pen) around the edge, and covered it with Laser Green glitter. 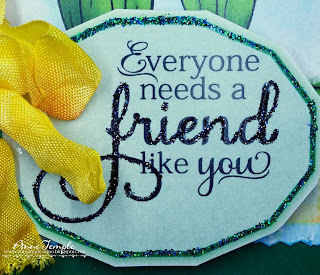 Next I outlined the word "friend" with the Sakura glue pen and covered it with Blue Raven glitter. For the focal image, I wanted to give it the look of depth even though it was one layer. I started out by outlining the colored image layer with the Sakura glue pen and adding more Blue Raven glitter around the edge. Then I used a colored pencil (yellow) and outlined the first patterned paper. Although it is very subtle, it really made a difference. And finally, I used my deckle cutter to cut the blue layer. 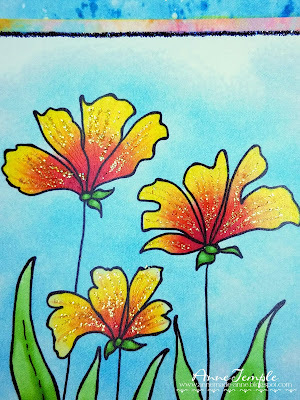 For the flowers, I added orange streaks using a colored pencil to the various petals and then added Lemonade glitter to each of the petals. This single layer focal point was then adhered to a piece of green cardstock. The sentiment was pop dotted and added to the center. I also adhered a piece of seam binding ribbon which was dyed with alcohol inks next to the sentiment. 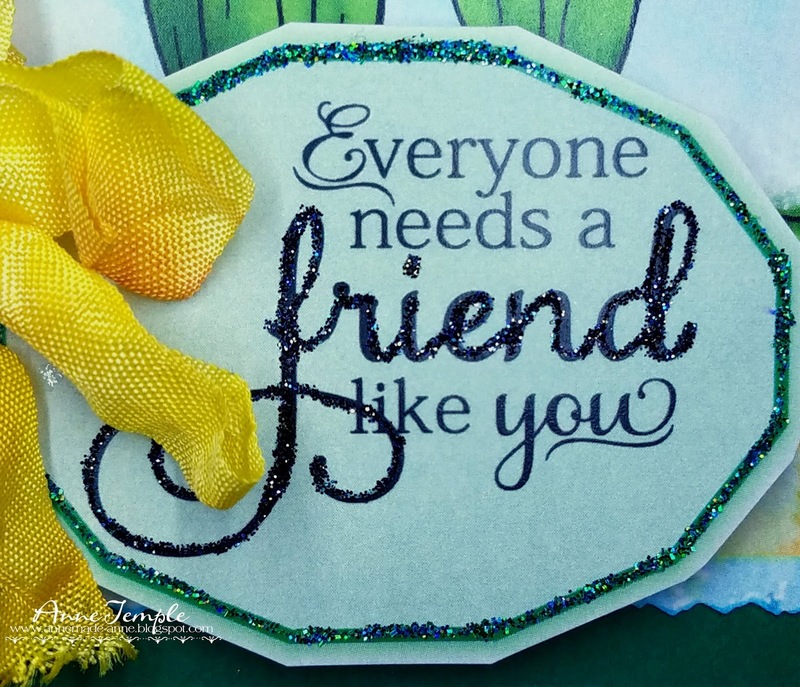 Love this card-Friend Like You. You mention using pre-programmed shape for the sentiment. Where did you findthe pre-programmed shapes? Is this another program or is it included in this bundle? Thank you.